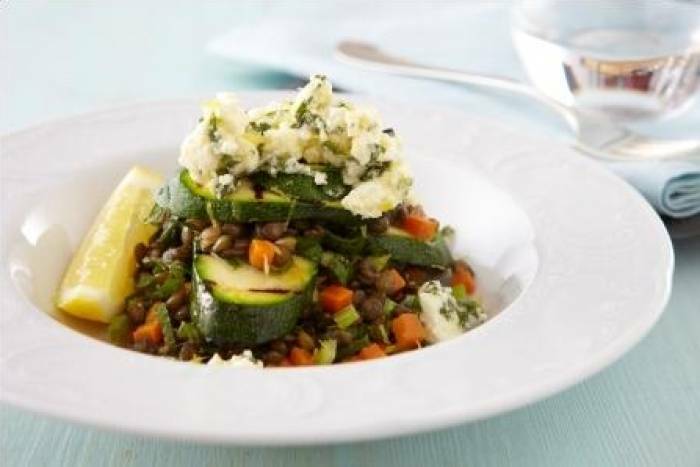 Puy lentils cooked with carrot, celery and lemon zest served with chargrilled courgettes, crumbled feta cheese and fresh mint. Place the lentils in a pan of cold water. Bring to the boil and cook until the lentils are tender. Drain and then rinse the lentils. Peel and finely dice the carrots. Dice the celery. Zest and juice the lemon. Heat a frying pan hot and then add the olive oil. Add the carrots and the celery and cook until they begin to colour. Add the lentils, lemon zest and juice to the pan and warm through. Season with salt and pepper and then set aside until ready to serve. Top and tail the courgettes and then cut the flesh into long strips. Heat a griddle pan and then chargrill the courgettes. Remove from the pan and season well. Crumble the feta cheese. Pick the mint leaves from stalks. Reserve some of the smaller leaves to garnish the dish before serving. Finely slice the larger leaves. Stir the mint through the lentils. Place a pile of lentils into the middle of a bowl. Garnish with grilled strips of courgette, crumbled feta and the picked mint leaves to serve.